Disclaimer: The information is gathered from a pre released version of AX7 and might be subject for change before final release. It has been stated that the next AX version will be equal to AX 2012 R3 when it comes to features, but there are some new knick knacks you should be aware of. 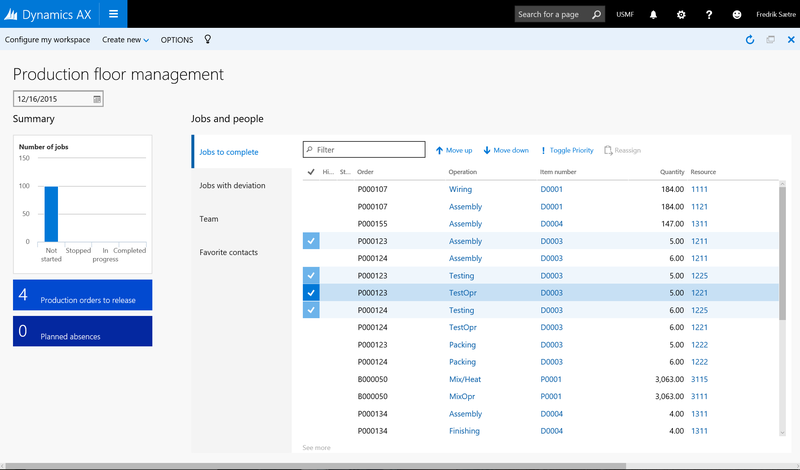 Mainly it’s the new user interface that offers some very nice new opportunities to interact with the existing data model. There are some new features as well. 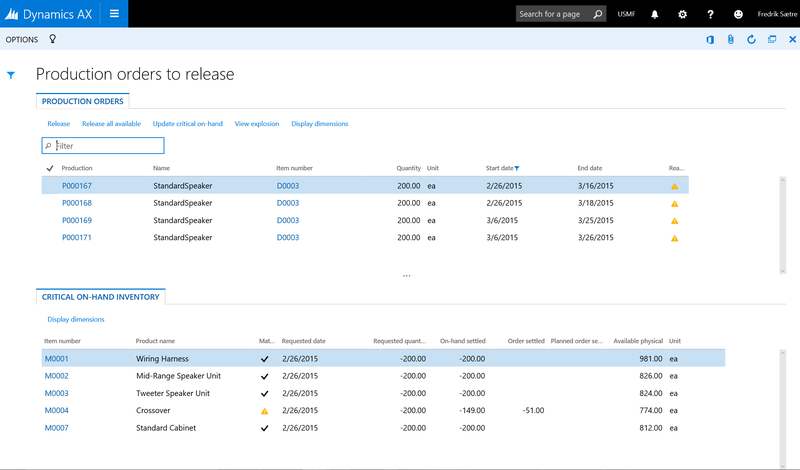 Workspaces are the new dashboard experience that Microsoft is introducing. It is basically a combination of different elements. The consist of PowerView reports, Tiles (Replace cues), A list of some tables with their own action menus and a set of links/functions. Together it is a very powerfull tool when used correctly. Production floor management workspace is created for the manufacturing shop floor manager or formen. A one-stop-shop for all their needs from releasing, prioritizing, managing the workers, managing feedback and so on. The visual impression is pretty nice and it gives new possibilities to combine insight and action. 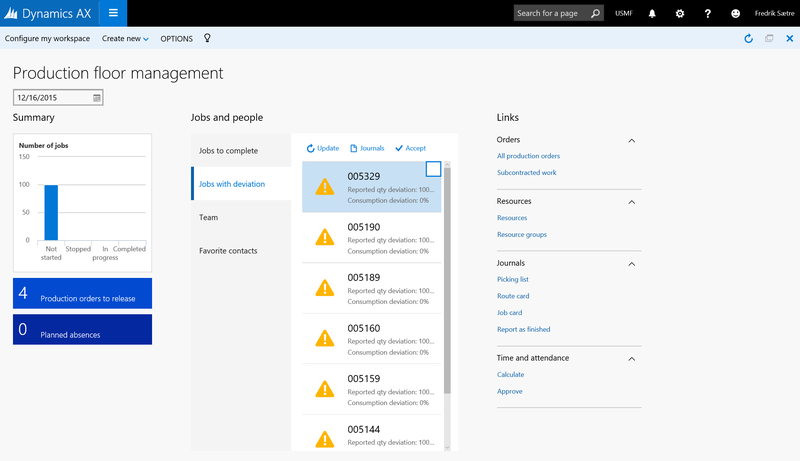 It is no surprise that the new interface is totally transformed and it takes some getting used to, but when you can grasp the new combination of forms and processes that it supports it is pretty obvious that Microsoft has been listening to their customers to gear the solution towards actual processes. 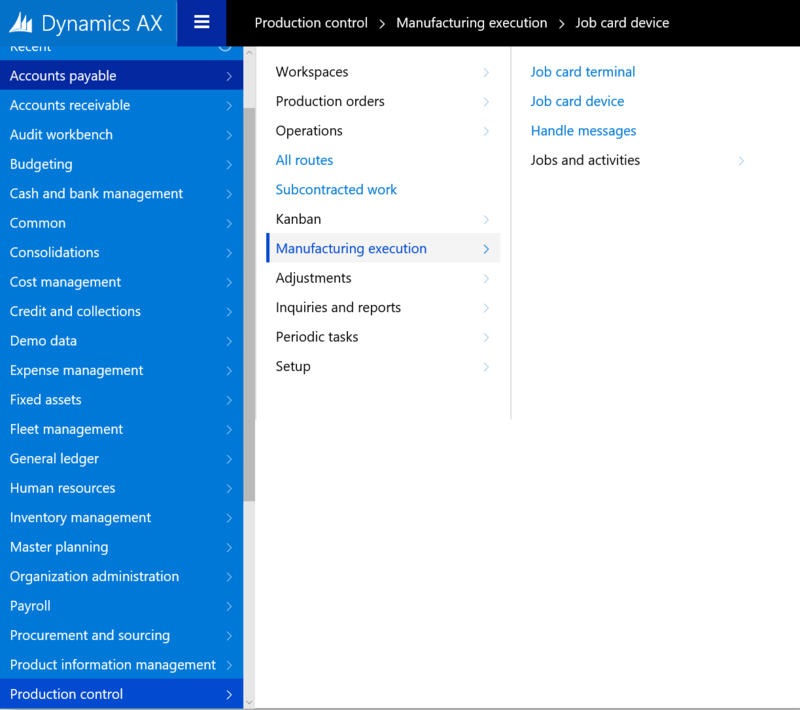 Like this beauty above which you are presented when clicking the “Production orders to release”-tile in the Workspace. In a glance it shows the critical on-hand which is crucial when releasing jobs to the manufacturing floor. Also they have moved away from the constraints of the menu structure (Common, Reports, Journals…) as well. Like accessing Manufacturing Execution. The job registration form is still present, but now it is called “Job card Terminal“. 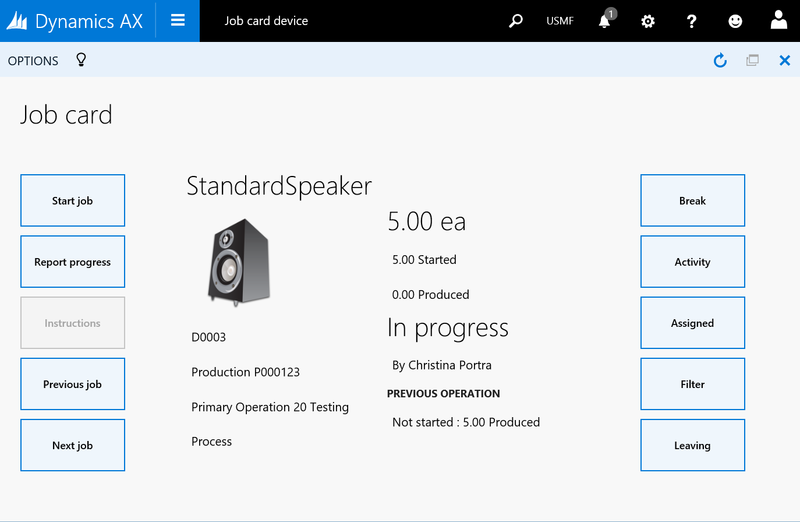 The new interface called “Job Card Device” is an alternative to the Shop Floor Control Job registration form and is actually very similar to the Windows New UI app that they developed. The interface is snappy and very intuitive! Production related buttons on the left side and actions related to the user on the right side. It works just like the Job card Terminal and is handling time and attendance with absence, work times, breaks and so on. Nifty! Looking forward to implementing this!